Anchorman 2: The Legend Continues is perhaps twenty minutes too long, and indulges in a little bit too much of the nostalgia common in comedy sequels during its final act, but it’s a movie with its heart in the right place. More message-driven than its direct predecessor, and much more of an ensemble piece, Anchorman 2: The Legend Continues is an enjoyable example of the sorts of cringe comedy that made the original such a cult classic. While it might not measure up perfectly, it ranks quite highly among the annals of comedy sequels. Watch! 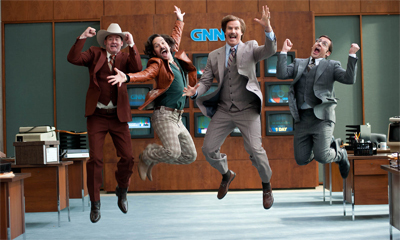 Anchorman 2: The Legend Continues Trailer! Via Paramount, here’s the latest trailer for Anchorman 2: The Legend Continues, which is being released in December. It’s a pretty big deal. Eagle-eyed viewers will spot some RTÉ footage in there. Great Odin’s raven! Watch! New Anchorman 2: The Legend Continues Trailer! Comedy sequels are, as a rule, a dodgy proposition. After all, you generally assume that the first film – if was successful – had really mined the premise for all it was worth. There’s a tendency to turn comedy sequels into remakes starring the same cast, as there’s an understandable reluctance to meddle too heavily with a successful formula and cast. So I’ll admit that I am a little nervous about Anchorman 2: The Legend Continues. Still, the trailer looks promising, and updating the characters to the eighties (complete with obligatory Journey soundtrack) could provide enough of a shake-up to keep things interesting. It helps that the original film has – I’d argue – one of the great comedy ensembles, and I trust Ferrell, Carrell, Rudd and Koechner to keep the sequel fresh. It looks worth a shot at least, and it certainly reminds me of what I liked so much about the original Anchorman without seeming like too much of a retread. The Campaign is hardly the most complex piece of political satire ever written. In fact, the movie suffers a great deal because its observations about political corruption feel fairly superficial. The relationship between donors and politicians, and the sway that what the movie terms “big money” has over elected officials, are hardly cutting insights into the way that lobbying and electioneering actually works. To be fair, there is something in the way that the movie parodies the tendency of US elections to get incredibly dirty incredibly fast, but The Campaign ultimately winds up feeling a little superficial. That’s not to say that there aren’t moments of wit to be found here. 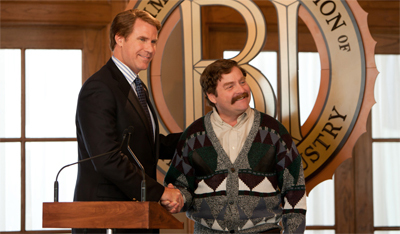 Both Will Ferrell and Zach Galifianakis are skilled comedians, even when the material isn’t necessarily up to scratch. And in order to make fun of the extreme rhetoric that such campaigns may involve, the movie occasionally pushes itself into the realm of the surreal. However, its observations and its targets seem so obvious that the movie can also be remarkably frustrating. A candid(ate) look at the electoral process?